While email marketing is all about sending content to a group of subscribers at one time, a nurturing program is about sending smaller bits of content to users over time. These smaller bits most likely are not running at the same time. Nurturing Dialogs are mostly useful for trainings, events, product training, service training and date based events. These are not useful for company news and updates. Sending a series of 3 or 4 emails to your subscriber when they join the newsletter and educating them . When a customer buys your product/service you can send a series of emails that train your customer on using the producr or the service. Send product renewal emails to your customer a month before their subscription expires. Send feedback surveys to a customer 7 days after purhcase of a product/services. Here is a demo of how a nurturing program works. 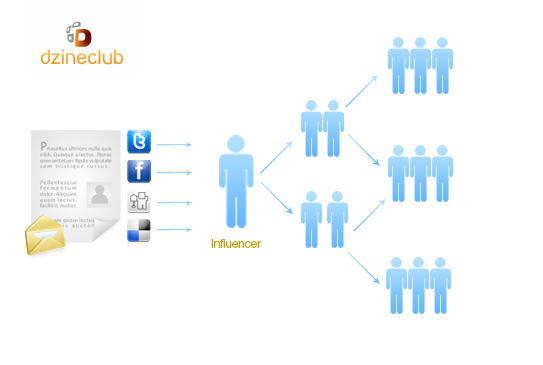 At DzineClub, we help our clients marketing themselves through various mediums. One of our more popular mediums is email Marketing. Using Dzinemail, our clients can set up emails and send them out themselves quickly and easily. We build good looking and usable templates for them and put it in Dzinemail where they can make changes in a “What you see is what you get” WYSIWYG editor and send out the emails. 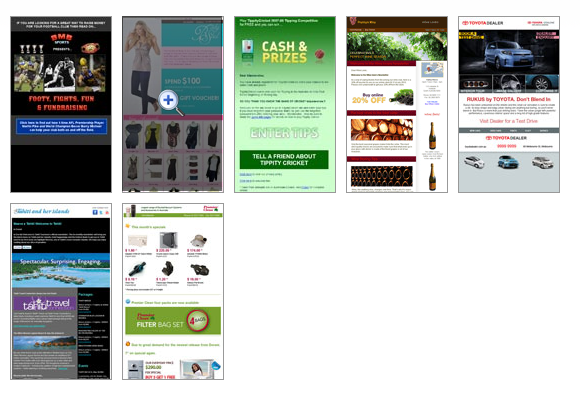 We have built an email templates gallery showcasing all the emails that we have done for our clients. We have just updated it with two of our new email clients “Tourism Tahiti” and “Premier Clean” with their templates. Please click here or on the image below to view the new templates. Need a Email Template that not only looks good but gets better Opens? 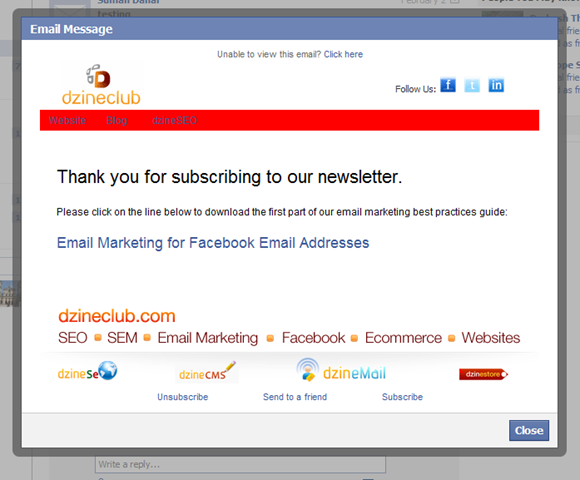 The DzineMail Email Marketing User Guide has now been updated with newer content. If you are currently using DzineMail to send out your emails and haven’t received the latest copy, please get in touch with your account manager to get the latest copy. The internet has been rife for a few months with the news of Facebook Messaging coming up. Facebook is not just launching an email platform but a whole new way we send messages to each other. So it integrates your emails, sms, Facebook messages from your friends etc. Given the amount of users Facebook has, and the fact that we use Facebook to connect to most of our friends, there is no doubt that this is the next big thing when it comes to emails and messaging. This could potentially be the next hotmail or gmail. Facebook messages is also now live, which means that some users are starting to get their Facebook email address as well. I have just recently got mine and started to play around with it. Over the coming days and weeks, more and more people will start having their own Facebook email address. You might start seeing Facebook addresses on your email subscribers lists soon. How do we optimise our email campaigns for Facebook email addresses? To make sure that when we are communicating with Facebook addresses, it all displays properly, we are doing some tests with generic emails to see which ones work well and which ones don’t. So here is what we are doing. We are testing all the emails to our Facebook address. We are sending a text email, a html email with a signature, an email with an attachment and finally an email from the dzineMail platform to see how they show up on Facebook messages. Here are the results. This just shows normally like any other message you get in Facebook. Rich HTML with signature gets stripped down to just normal text. What is also a bit weird is that if you have two contacts with the same name, then the display picture might be pulled from the contacts name rather than email address. There is an expand button which we thought would show the HTML but just came with a blank email. The next stage was testing a PDF attachment to the email address. Here are the results. This worked very well. The next stage was testing an image attachment. There was no doubt that this was going to work very well as well. So we finally come to the last test where we are seeing how a normal email marketing formatted email shows up in Facebook emails. Not to be too dramatic but the result of this could very well change how we do Email Marketing forever. Result: so we sent out an email and we got the email with the subject line. So a normally formatted email marketing email doesn’t show up in Facebook. The emails are now showing in Facebook for properly formatted email addresses. Based on the results we have created a Email Marketing Best Practice Guide which is a PDF download. We will be doing more testing and summarizing the results in a download. Please subscribe to our newsletter to receive the emails. DzineClub is a fairly new business so not everyone knows what we do and what we are currently working on. Everyone that we have been talking to is asking what Projects DzineClub is working on currently. So I thought we would put up a list of our projects so that you know what we are working on, our expertise and if you have a similar project in mind. We are currently doing the whole digital strategy for a rapper in California who is about to launch his debut album. Hopefully this gives a basic idea of the projects that we are capable of running. Feel free to reach out on info@dzineclub.com for any questions. Integrating your Social Media with your Email Marketing creates an opportunity for your email content to immediately go viral. If your content is great and it gets shared by a Social Media influencer, you could reach a huge amount of users by sending out your normal email newsletters. This will help you push your brand out. We have started uploading Email Newsletters that we have done for our clients in the past. Some of the designs are outdated and we are starting from the start so we’ll add them over time. So for examples of emails that we have done head over to our email marketing section under Services. Once we have uploaded about 20 odd designs, we’ll create a separate page for them. Please click on the image or the link to view our email newsletter showcase. Our Newsletter Showcase gets updated every week with new designs so please bookmark the page. Also if you haven’t checked it out yet, please click here to see how you can send out an import a list, set up an email campaign and send it out in 5 minutes. To showcase the capabilities of our Email Marketing platform, here is a quick video that shows you how you can import a list of subscribers, set up a professional email campaign, deliver it to that list and view reports all within 5 minutes. You can essentially have this email marketing platform set up with your customised email template within 24 hours. Contact us to find out how you can send out your email within 5 minutes. To view a larger full screen version, please click on the video and use the fullscreen button. Description: will automatically fill with your email address. Click on Save. This will verify your email address. If all of your details are correct. It will then set up your email address and will come on the list. You can now go back to the home screen and check your emails.